Mortgage-backed securities create opportunities for financial companies to grow revenues but don't lose sight on the challenges of the past. 2018 was a tough year which tainted financial results as uncertainty hit many companies hard in the 4th quarter. The potential for a value trap exists when you focus too closely on the dividend and forget about sustainability. What happens in the event of a recession. It was not too long ago that mortgage-backed securities were kind of a dirty word precipitating the start of the financial crisis of 2007-09. The way they work is you take an individual mortgage owing on a property, bundle it with other mortgages then offer investors the opportunity to trade them as securities with the mortgages forming the underlying asset base. The problem was that the securities were trading at significantly higher values than the underlying mortgage assets causing an eventual meltdown. Regulations have tightened up many of these issues but I still believe they present a risk component you don’t see in traditional banking. 2018 was a difficult year for the company as markets provided stiff headwinds impacting the valuation of underlying assets for Annaly which impacted earnings. The company has struggled in an increasing interest rate environment which has compressed margins. The result was a significant drop in full year earnings compared to 2017 as well as pressure to maintain a generous dividend currently yielding close to 12%. Highly interest rate sensitive NLY is looking for rate stability to drive future growth. Instability in the markets created valuation drops across the sector in 2018 highlighted by a challenging fourth quarter which put pressure on NLY's bottom line revealing the cyclical nature of this investment. With increasing interest rates, Annaly has seen a narrowing between interest income and expenses as well requiring greater amounts of leverage to produce declining results. Their stock price has also declined as additional shares have been issued to grow their capital base without the results transferring to the bottom line. A stabilization of interest rates could help them to catch up in 2019; however, with interest rates still below long-term averages, there will be pressure to continue increasing as the economy continues to grow negatively impacting Annaly. Another concern for me is that the issuance of additional shares without the profitability that is needed to sustain that growth creates pressure to cut the dividend. The added share count combined with a generous dividend is also placing strain on the cash flows needed to sustain that growth. That encourages the company to issue more shares to meet short-term obligations in an unsustainable cycle. The cyclical nature of the company’s earnings makes them difficult to value based on a challenging 2018 where there were significant devaluations of underlying assets impacting results. I believe that the P/E should return closer to normal levels in 2019 but their ability to maintain their dividend will have a significant impact on the stock price. With almost no capital appreciation in the stock since their last dividend cut in 2013, shareholders are simply buying the stock for the dividend. If that dividend were to fall that could mean a further drop in the share price as investors sell-off. In 2012-2013, the share price went from $14 to $10 as the dividend went from $1.50 to $1.20 per share. This would create big challenges for me as an investor having gone through similar valuation traps in the past with other companies where an attractive dividend drew me in only to see the share price collapse when the dividend proved unsustainable. What would happen in the event of a recession? In 2009, following the financial crisis, Annaly benefited when interest rates started to drop as a means of stimulating the economy. As the Fed cut interest rates close to zero, spreads increased for existing loans lenders held on the books as the consumer rate dropped at a much slower pace, which benefited net interest margins. With many mortgage and loan customers locked into higher interest rates, the company was able to take advantage of increasing spreads as short-term rates dropped. At present, the opposite is true with increasing interest rates shrinking net interest margins in the short term as lenders try to catch up. Other complicating factors include political interference as well as economic instability which has not provided the certainty that most investors prefer. This uncertainty is sure to continue into 2020 as the Fed continues to push for interest rate normalization while the White House presses their more shortsighted agenda. In spite of the opportunity created by improved NIMs following the end of the financial crisis, the company was forced to cut the dividend. In a reverse scenario, where margins are shrinking, I believe the risk of a further cut exists. 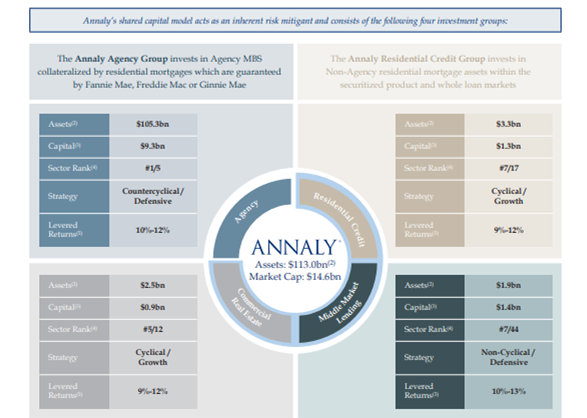 The advantage Annaly has over some of their mREIT competitors is a diversification within their income stream providing them the opportunity to pivot depending on the circumstance. That said they are very interest rate sensitive and just as they were able to benefit from the drop in interest rates through larger spreads during the last recession, they are now being challenged by increasing interest rates and compression of spreads during this rising rate period. Although they are less levered than others in the sector, I have concerns that they are using more leverage to generate results and issuing additional shares to drive capital expansion rather than growing based on increased profitability. Based on their 2018 year-end conference call, I believe they will continue this strategy which could lead to further share dilution impacting share price. I also have concerns that they may be forced to cut their dividend to a more sustainable level which would have a negative impact on share price for this dividend-driven stock. With their debt ratios rising and interest rates being currently stable, but with the potential to rise further, I have concerns that their payout ratio will continue to trend higher. With a current yield exceeding 11%, Annaly is a very attractive investment for the dividend investor and for that reason alone, it could be considered a buy at current valuations. With that said, I do believe the risks to this stock are high as a cut to the dividend could have a significant impact on the overall valuation so it is not the kind of stock you buy and forget as many dividend investors would prefer to do. Personally, I am a buy and hold forever kind of investor, so Annaly is not the kind of company that I would choose to own in my portfolio of lower-risk companies.